End of the residency.. Unsettled Certainties.. 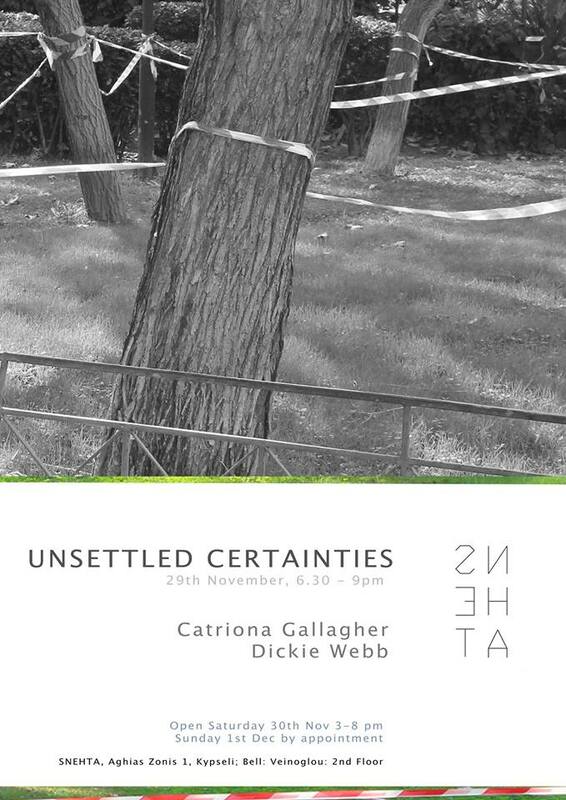 So Catriona Gallagher and myself wrapped up our time here on the SNEHTA residency with a small exhibition titled Unsettled Certainties. Over the two days we had some interesting conversations with people we had met and others we had not from our time here in Athens. It was a great way to finish our two months and hopefully will see either of us or both returning sooner rather than later. I will post some images over the coming week. 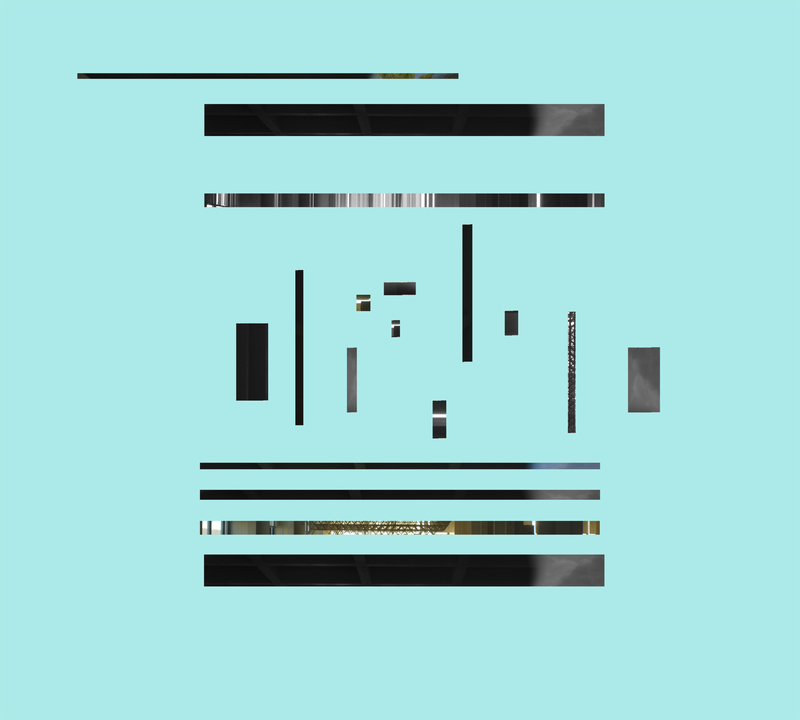 For now here is a little GIF teaser from a sign piece I made which is the start of a new series of work titled “Concept Of Since”. Gallagher and Webb have both been occupied with the notion of place, comprehending what it is to be settled or grounded and equally seeking intermediate sites to challenge their knowledge. Through certain and uncertain exploration they have found different places to work within the Athenian landscape. Gallagher has been making interventions that highlight absurdities in the preservation of heritage and trying to understand the notion of shelter when that becomes necessary. Webb has concerned himself with liminal spaces, sites that were but are not now, since certain events occurred. He has created reflective intermedia works that question what now, post since. “Unsettled Certainties” is a synopsis of their research and time at Snehta and points towards possible resolutions in the future. Βασικό θέμα έρευνας των εικαστικών Ghallager και Webb είναι η έννοια του τόπου, ο τρόπος με τον οποιό αντιλαμβάνεται ο καθένας τις ρίζες του, και τη βάση της ζωής του, που συναρτάται με κάποιο χώρο. Η τυχαία και πολλές φορές συμπτωματική διαδικασία που οδήγησε τους καλλιτέχνες στην ανακάλυψη τέτοιων σημείων-τόπων, τους ώθησε να επικεντρωθούν καλλιτεχνικά σε διαφορετικά σημεία της Αθήνας. Πιο συγκεκριμένα, οι παρεμβάσεις της C.Galagher, τονίζουν τους παραλογισμούς στην συντήρηση της Ελληνικής κληρονομίας και φανερώνουν την προσπάθεια της εικαστικού να κατανοήσει την έννοια του καταφύγιου όταν αυτό είναι παρόν, ή όταν αυτό μοιάζει απαραίτητο. Η επιβεβαίωση του άστατου και συμπτωματικού χαρακτήρα που διακρίνει τον τόπο και το καταφύγιο συνοψίζουν την έρευνα που έγινε μεταξύ των δύο μηνών που οι καλλιτέχνες αφιέρωσαν στη Snehta. Μέσω της ερευνητικής αυτής διαδικασίας, δίνεται η δυνατότητα σε καθένα από τους δυο καλλιτέχνες να προχωρήσει και άλλο την εργασία του στο μέλλον προς την κατεύθυνση αυτή. So this week spent on Sound Tectonics is coming to an end. A week I will not forget, spent with one great team of artists, architects, sound artists, composers, theorists and just generally inspiring people. The week has been focused on discussing the relationship with sound as a material and its relationship and use within the architecture of Athens and beyond. So today, Sunday 24th November, will see the unveiling of a prototype which encompasses some of the thoughts, skills and discoveries made these past 8 days. 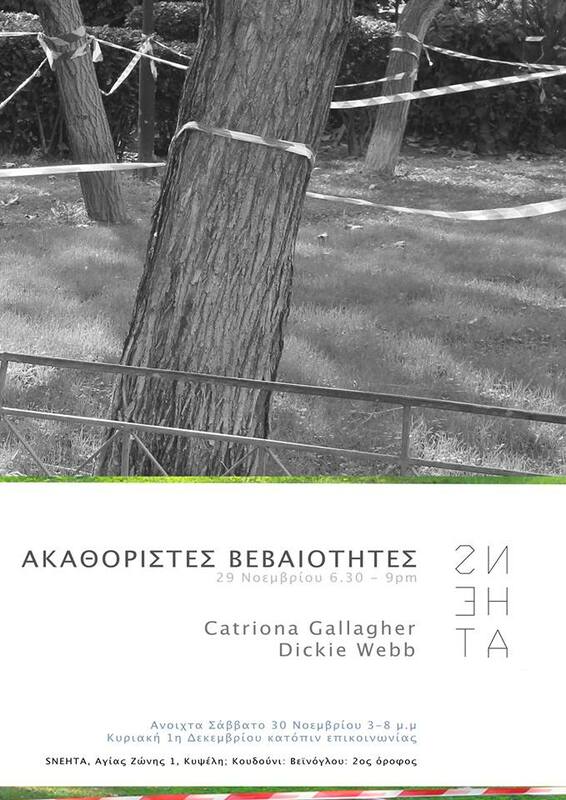 If you would like to come and see and meet some of those involved we will be having an opening at 6pm at the British Hellenic College here in Athens. Please see the photo for more details of the location. Athens Arrival – Yet Soon To Be Departing.. Earlier I posted a first draft/edit of a sound piece that I have been working on whilst here in Athens. Here is the edit with more work done to it and at the moment I am moving onto new tracks. I may return to this but at present this is now finished. I am now looking at ways to combine the audio samples used within Athens Arrival with the visual sample that this glitch sounds were created from. I hope to have a few new workings of this come next week. I have an ongoing fascination with the works of The Center For Land Use Interpretation (CLUI). Today I have been reading a few articles and interviews with the Founder and Director Matthew Coolidge. He has published a new book through CLUI titled: Around the Bay: Man-Made Sites of Interest in the San Francisco Bay Region. The interview with Amelia Taylor-Hochberg – Archinect discussed various elements of this book and also Coolidges’ work for CLUI and as lecturer. MC: The class was based on the idea that there is no nowhere. We used that kind of terminology for the first part, but it morphed into another kind of class, that perhaps I would have called “somewhere”, if we had to call it something. But it was all so that this idea of “nowhere” doesn’t exist; there is no “away”, you can go away but then you’re there. This notion of “someplace else” is just sort of obsolete, in the same way that the old idea of nature is obsolete. Everything’s been discovered and visited and inhabited and interacted with and is connected to everything else, in a sense of an ecology; interconnected in the broadest sense of the term is also something we think about. But the class was meant to introduce, to challenge, that idea. Certainly there are the facts and reality situations, then there are our impressions and our beliefs, and those things are often in interesting contrast. I wanted to work with the students in examining a place that wasn’t in their consciousness; that was considered somewhere that they wouldn’t normally go. It was a curatorial practice program in the graduate department. We would go somewhere in southern Louisiana or wherever and experience the sense of being from somewhere else; of going there and trying to make sense of it and establish a place there, an interpretation of it. Each year the class created an impression and an interpretation, in the form of some exhibit or public program, related to the place we visited. And with a very conscious awareness of their view of it, as a type of interpretative mechanism between the viewer and the observer of the object. It was this idea of the subjectivity creating a sense of a place. That is a very subjective and interpretive thing. And in general, objective awareness is something that we’re awfully conscious of with everything we do — the view creates the object, and the medium that presents it modifies it. It’s impossible to really see objectively. To read the rest of this interview please click here. Working on the ^up Beat. The fluid nature of No Sir E’s tracks and the way he mixes sounds to create textures and melodies is an ongoing inspiration to the works I am trying to in my mind create.